August 4, 2013 By Allyson 27 Comments This post may contain affiliate links. Read my disclosure policy. I usually start most Mexican food themed blog posts saying something like, “If you know me, you know that I love Mexican food….”, however I think I have gotten that point across already. So here we are with another Mexican food recipe, and sure enough it’s delicious. This recipe is super easy and quick, and it’s likely you have most of the ingredients on hand. The only thing I had to run out for was a red onion (I only keep bags of yellow onions in the fridge) and fresh cilantro….wait, what was that? You don’t like cilantro? Oh, well, just skip that ingredient and leave it out! I don’t understand all the cilantro haters, but to each their own! You can also use pretty much any cheese in here, but I liked the pepper jack for a bit a spice….however, these tacos are not spicy, and very suitable for kids. In fact, next time I make them I am going to add more chili powder or something because I’d like a little more punch to my tacos. Feel free to do the same. Before I made this, I had never ‘fried’ corn tortillas. Call me crazy, but I’ve never made a recipe that called for a crispy corn tortilla…until now. I am not crazy about frying things, and I think the less oil the better. With this recipe, you don’t need to go crazy with the oil….Spray the pan with your Olive Oil Sprayer or swirl a bit into the pan. You don’t need a lot. You could probably even use none, and just let them get crispy with time….I’d recommend using a little though, come on, this is Mexican food after all! Having a nice cast iron skillet will also help with the crispy shell! So anyway, quick tip about the tortillas- Be sure to lay each one down in the pan and heat for a few seconds before you put the filling inside. I thought maybe it would be easier to make them on the counter, and then put them into the pan….well guess what? All my corn tortillas broke in half at the fold. Luckily this only happened to 3 and I learned from my mistakes. 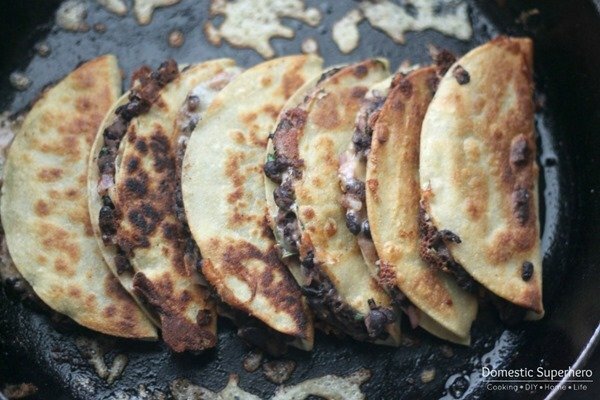 Just throw them in the pan, and then after a few seconds put the filling in the shell, and use a spatula to close the tortilla. Let it get crispy on each side (just a few minutes per side), and then you are done. Done and done. Do it. 1. In a medium bowl, add beans along with red onion, cilantro, and spices. Add a pinch of salt and lightly mash all of the ingredients together. 2. In a large, non-stick skillet or cast iron skillet, add a few tablespoons of oil and heat over medium-high heat. 3. Add one corn tortilla at a time and let each get hot in the oil for a few seconds. Then add about 1/4 cup of the bean filling to one half of the tortilla. Press down and even out with back of spoon. Top with a sprinkle of grated cheese. 5. As the first tortilla cooks, move it to the side and do a second one. 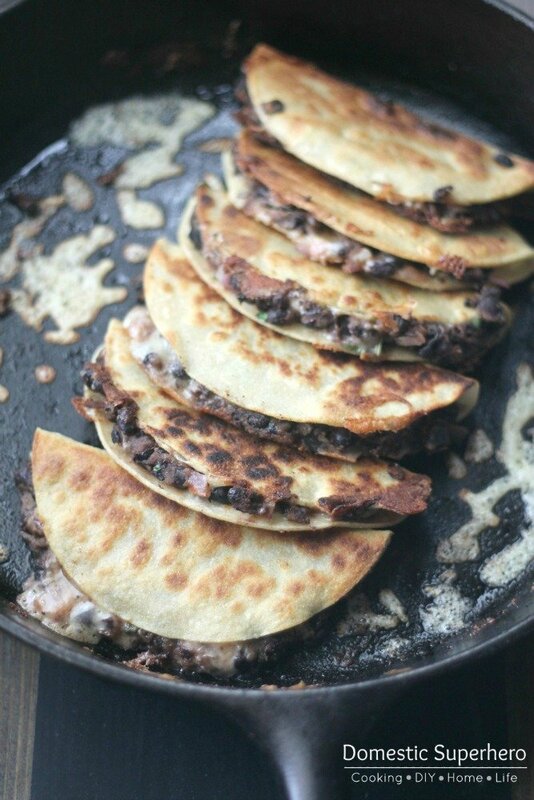 Depending on the size of your pan, you should be able to get 2 or 3 tacos at once. If you have a griddle you can do even more at once. 6. 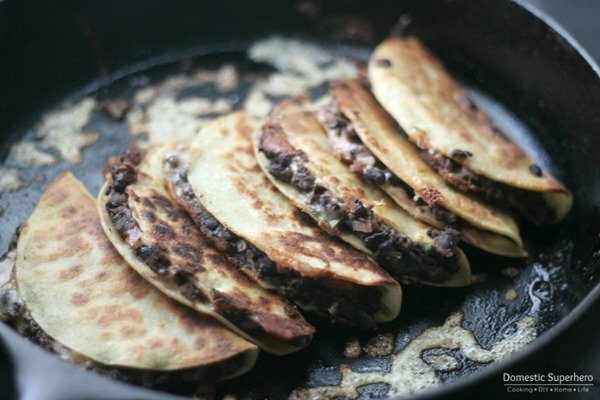 Cook each taco for about 3 minutes per side until they are nicely browned and crispy. 7. 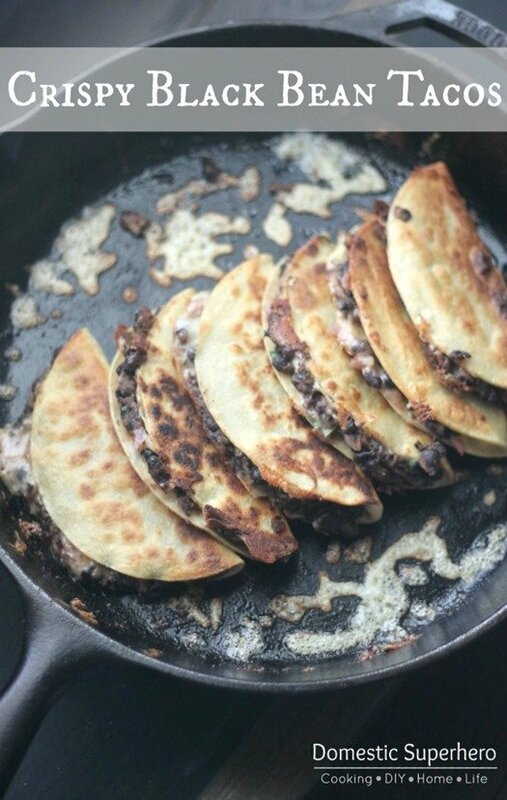 When flipping the taco to cook on the other side, use a spatula and flip the taco toward the fold so the filling doesn't fall out. I slide my tacos to the sides of the pan to keep the toppings inside (opening against side of pan). 8. Serve tacos with toppings like hot sauce, salsa, avocados, and sour cream. Note: Corn tortillas are resilient to heat. Don’t worry about burning them. They are very flexible. Just be sure to cook them on each side long enough to get them really crispy. **These photos were taken after the tacos were already cooked. You should only have 2-3 in the pan at a time as detailed in above directions. These look delicious! I also love Mexican food. Yum! This would be perfect for my meatless monday routine 😉 Thanks for sharing!! I was wary of these but they are amazing! Even my 6 and 3 year-olds loved them! I used tongs to flip the tacos over so that I could pinch them shut, not letting anything fall out. Next time I’m going to make extras for lunches. Thanks, Katie! I am happy you tried them out and exceeded your expectations! Making these tonight! I love me some Mexican food too, thanks for the recipe. Wow! I just made these and they were amazing! I just made these, subbed the corn tortillas for flour (corn are hard to find in Switzerland) and added sautéed zucchini and jalepeno, they were great!! I am sure they were delicious with flour! So glad y’all loved them! I always pre-heat my tortillas before filling them and frying them. That will make them pliable so they won’t crack. This is one of my new favorite recipes and I’ve made them three times in the last month alone! It’s inspired me to try some add-ins – I just made them for lunch and mixed in corn, spinach, and sweet potato.